Finally, the day has come. 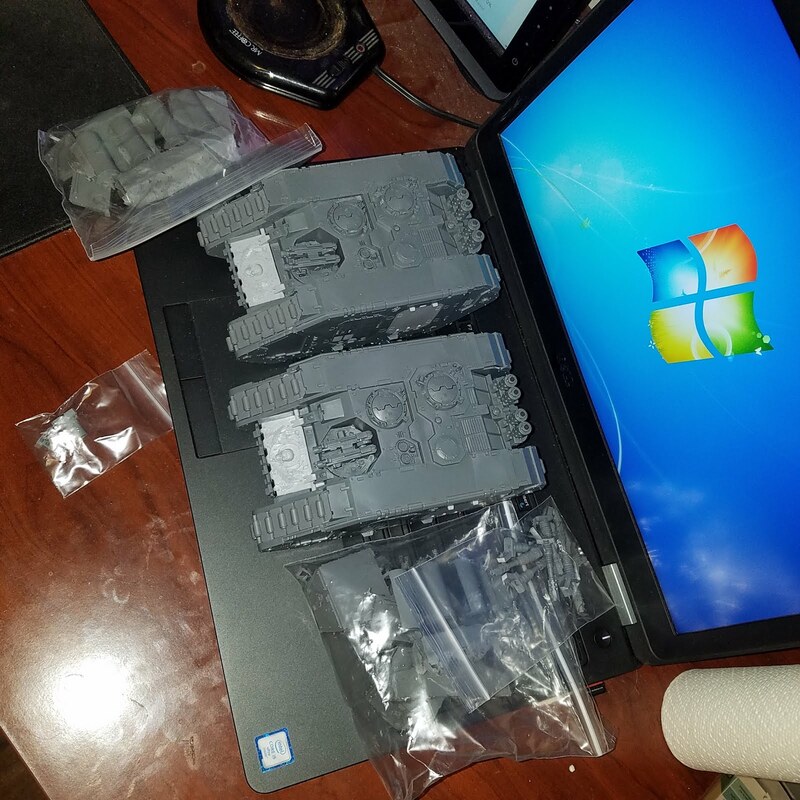 Last week I ordered the 2 sponson sets and two laser cannon sets I would need to finish off my Land Raider MkIIa's. I got the kits in today, and seeing as I am flying to AZ next week for a week and a half, I wanted to get one assembled and get a tutorial up on it. The kit is well though out. 2 cylinders in halves, weapon mounts, predrilled for magnets (NICE!) 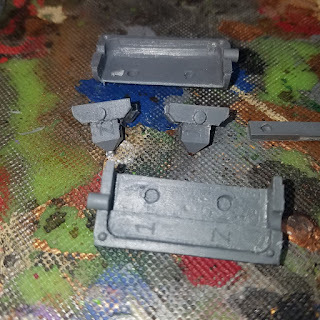 guide rails for weapon mount pivot (REALLY NICE) and top and bottom of the sponson, again set up for magnets. Nice part is that all of the parts have really nice locator pins for assembly. 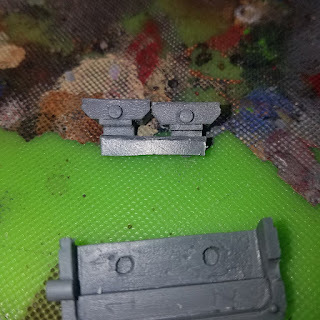 The cylinders are labelled with spots 1 and 2, as are the weapon mounts, and the guide rail has 2 pin mounts to set up the up and down movement. 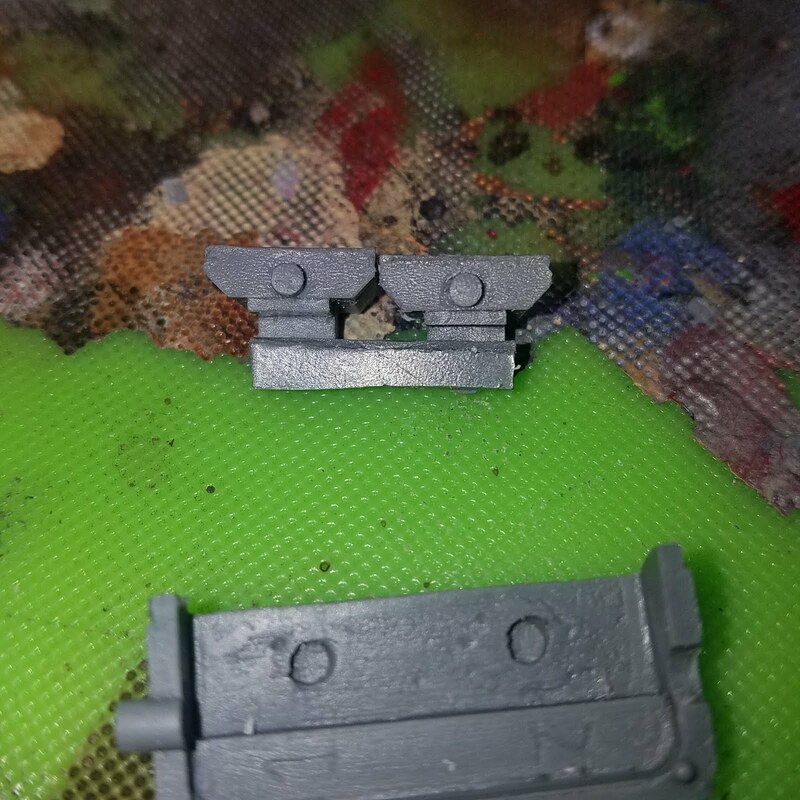 Here I have the guide rail connected to the gun mounts. Nice and tight. The back side without the mounts sits on a raised part of the back of the cylinder, keeping the guide rail on the back of the gun mounts. I stuck the plastic doors on with bluetack, and figured out where the sponson would sit. I wanted to use the step as a height guide, so scraped and then filed the 2 rivets off. I filed the inside of the door flat, and then shaved off the bottom step on the outside of the door. 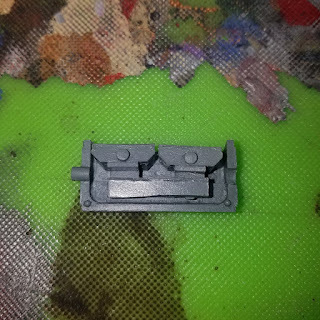 I will be using this as the mounting plate for the sponson. It's flat on the back, and wanted a really solid mount. Lined it up where I wanted it - just a bit farther forward of the Crux on the side, sitting on that step. 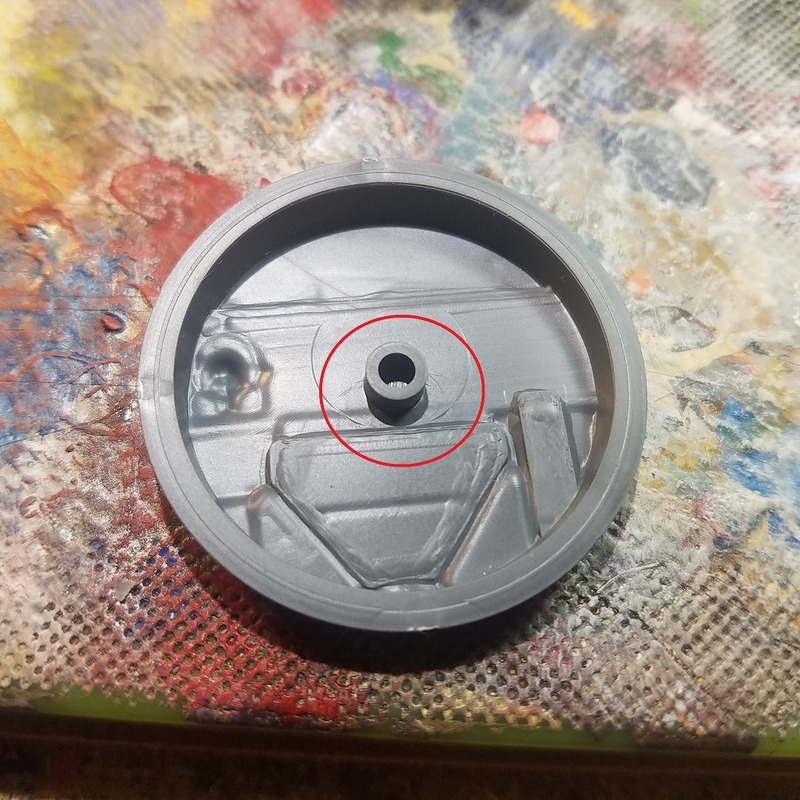 However, while fidgeting around with the sponson placement, I must have jarred the guide plate loose from the inside of the cylinder. 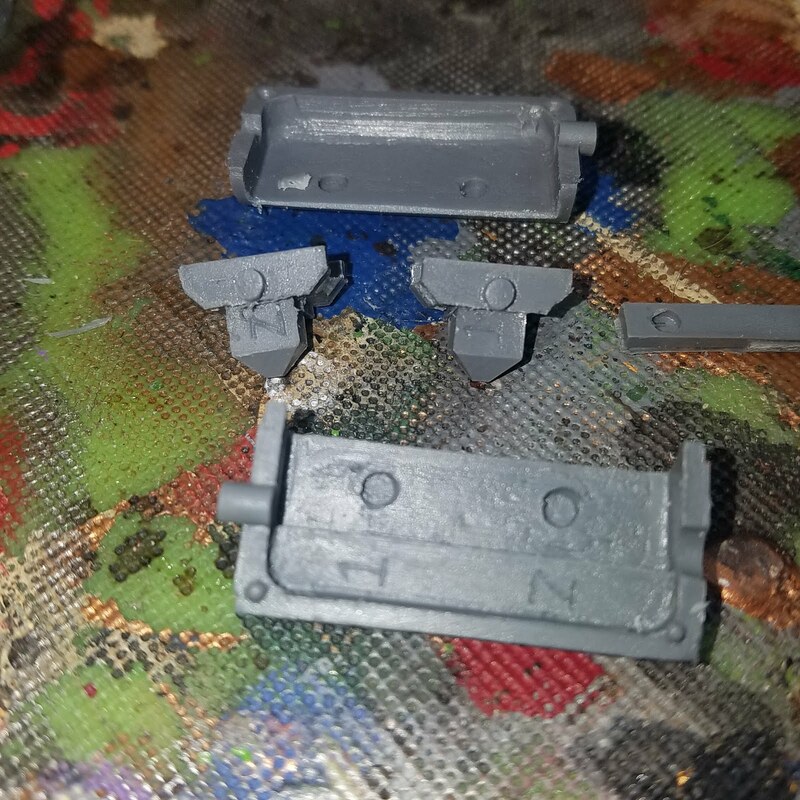 I ended up make the guns face straight ahead, and glued them in place. The cylinder still turns, but the guns don't move up and down. I scored the sponson at the top edge where the weird angle part of the door started. This gave me an alignment mark to work with when gluing the sponson to the door. I stuck the door to the sponson, using the score mark and the edge of the sponson to get the alignment right. 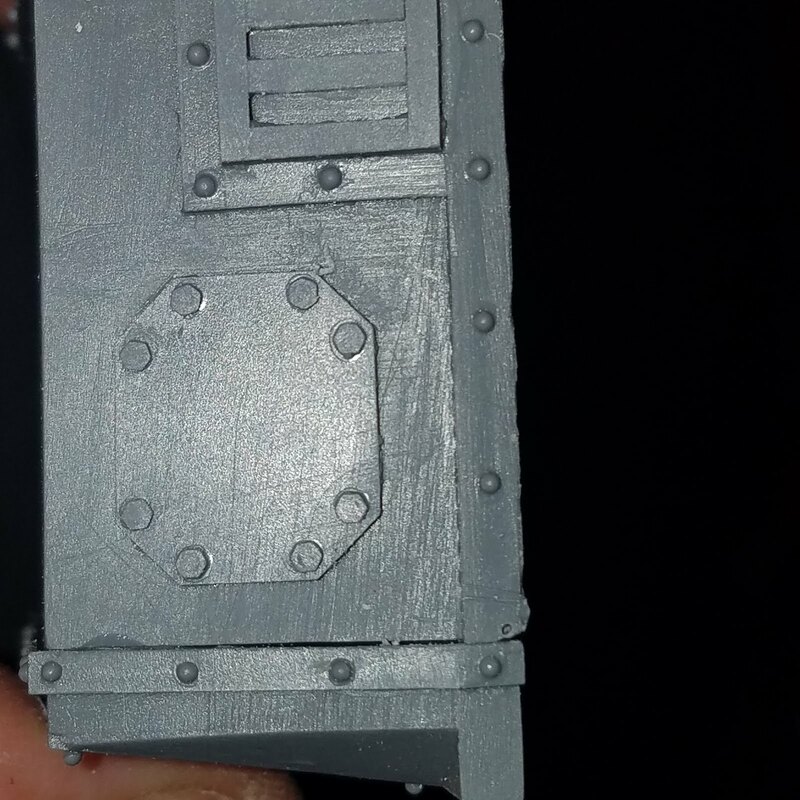 I then glued the sponson on, making sure to glue the door to the door hole, and the sponson to the side of the tank. It's secure and not coming off! Overall, assembly was less than a 1/2 hour, looks killer and aside from my own mess ups, a great kit. 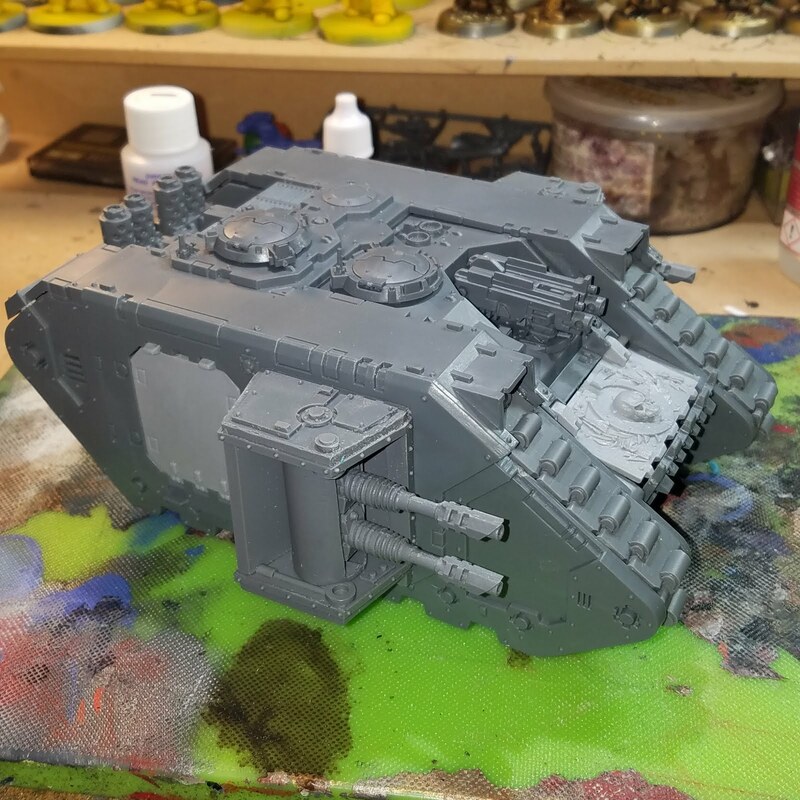 One more to go, and both are together awaiting their squads and then the tanks to be painted. 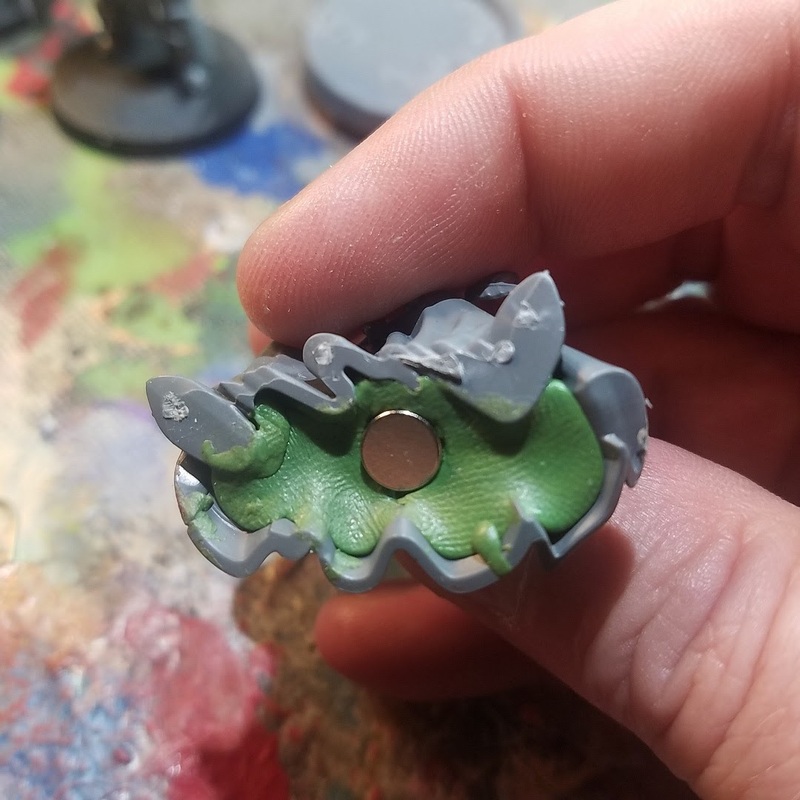 Lots of flat areas, so i might have to order up some special adornments from FW to fill out those sides. I have so many tracks left over, I might just use those to equip these bad boys with "extra armor" WW2 style. So, while chatting with a member of my FLGS gaming group, I was asked about a painting tutorial for purple on a Stormcast Eternal. He stated he wanted purple where the pink was, so I figured I would give it a go. I wanted to produce something that was fully reproducible. 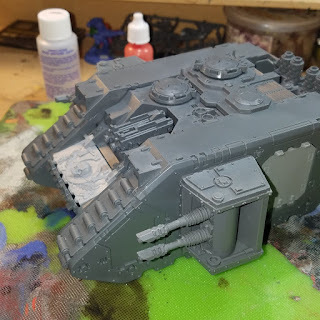 Step 1 - Prime the model black. I used Vallejo Poly Acrylic primer, and shot it with my airbrush. After it was dry, I decided to tackle the black armor first. No, normally, you can go with a grey extreme highlight, but to do this you have to have tons of brush control, and even then, the highlights look wonky to me. I decided to give this one a shot of the old "off black" treatment. An easy way to quickly highlight black that will give the black parts some color variation. I took P3 Coal Black, and mixed it 50/50 with GW Abaddon Black. This was applied in a drybrush over the whole of the model. 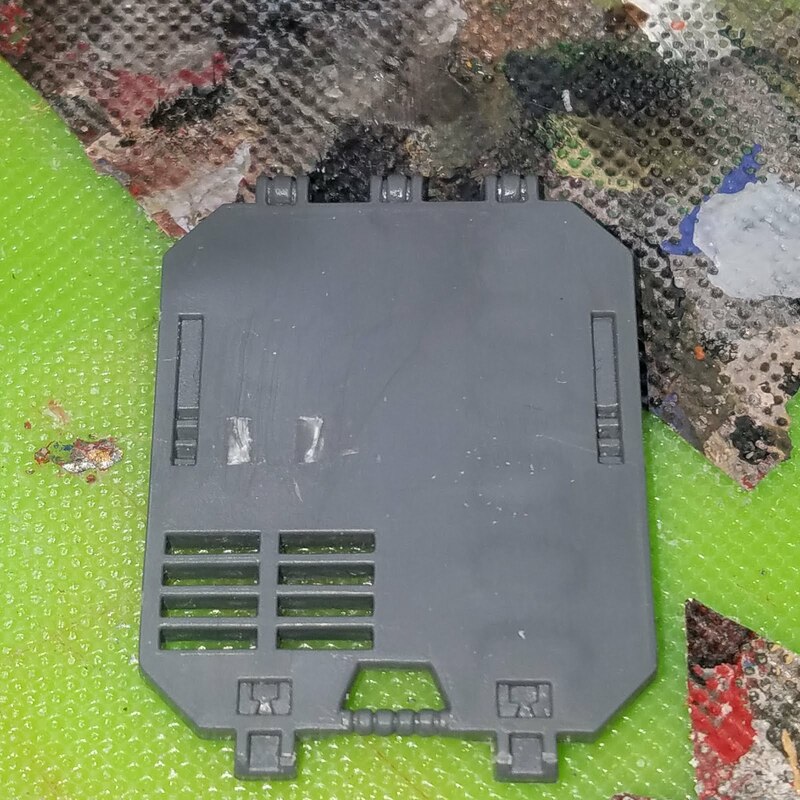 I then, added more P3 Coal black (about a 75% Coal Black to Abaddon), and drybrushed again, going lighter this time. The last really fine, controlled drybrush was with straight P3 Coal black. 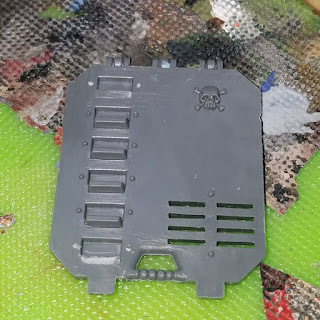 Alternately, I could have just applied a straight up light drybrush of Coal black, and then used Nuln Oil wash to tone it back. 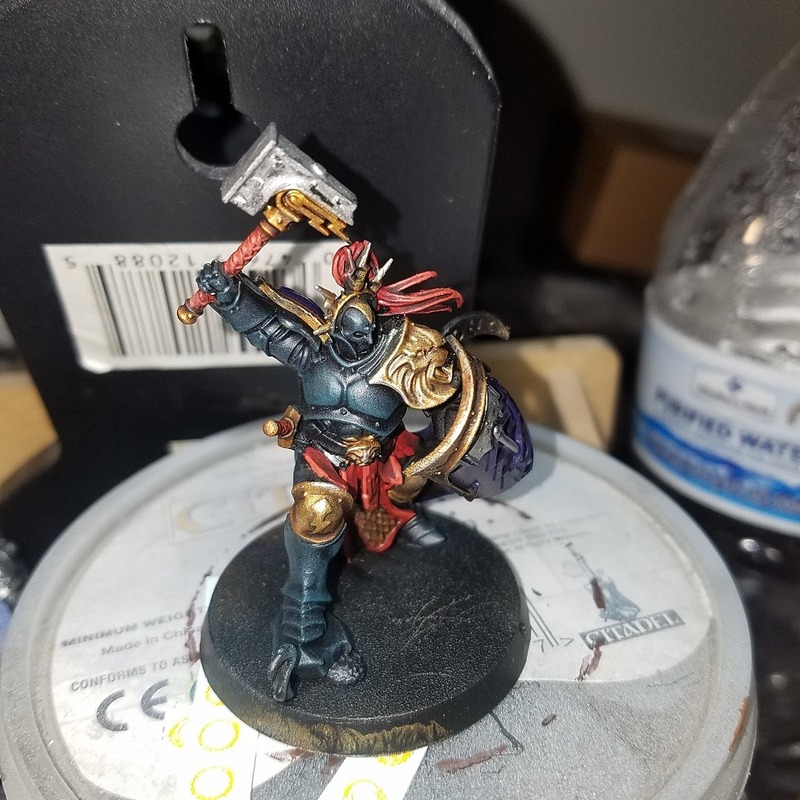 Step 2 - Color blocking golds. 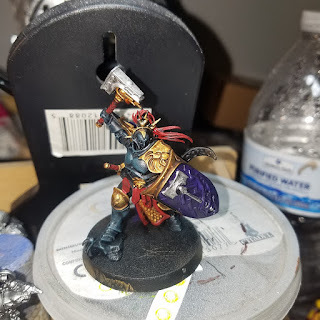 Using GW Retributor Armor, I blocked in the shoulder pad trim, shield trim, and various other bits and bobs. 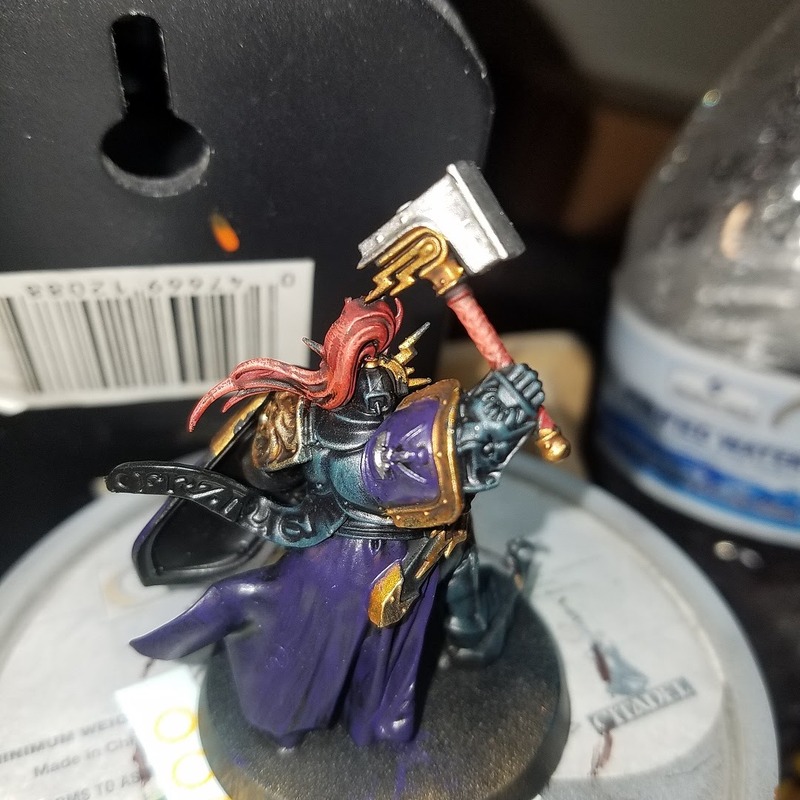 I applied GW Mephiston red to other trim areas, like the hair, lappets (the strappy things hanging over the codpiece), and hammer grip wraps. 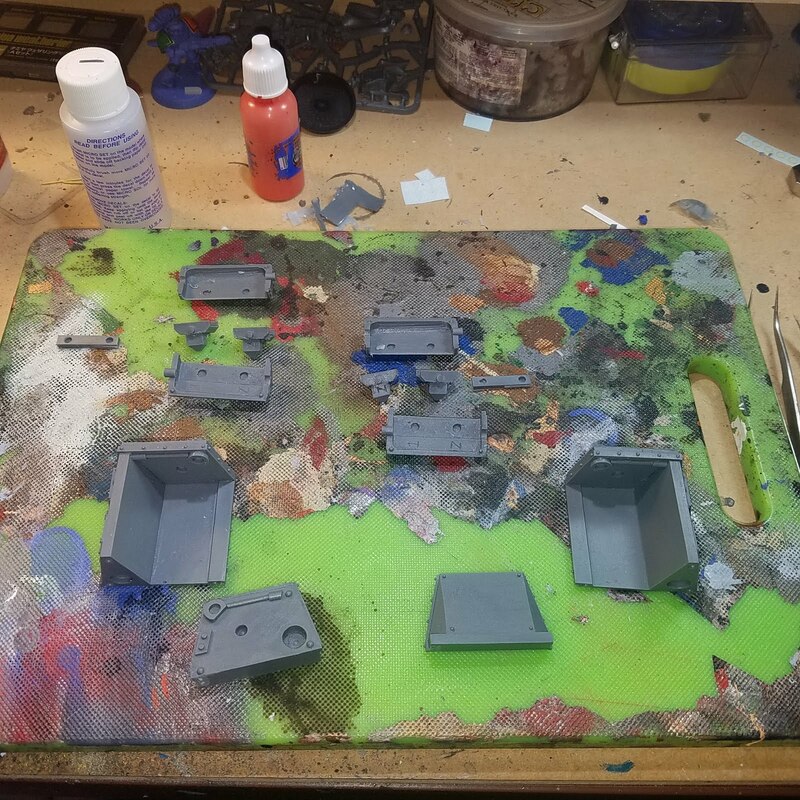 After this dried, I applied a wash of GW Agrax Earthshade. 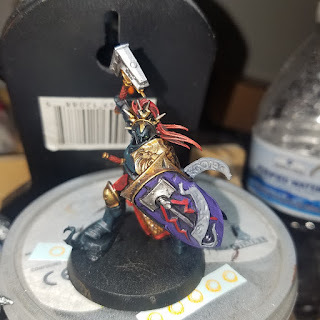 Step 3 - Color blocked out the GW Naggaroth Night on the shield, shoulder pad, and the rear tabard. 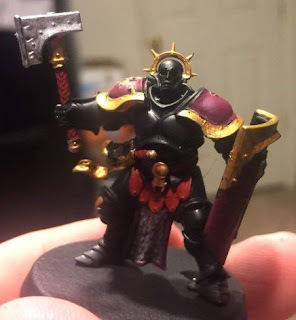 I also applied GW Ironbreaker to the hammer sigil on the shield and shoulderpad, as well as the head on the hammer. 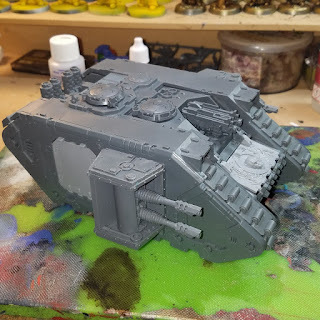 I went with this as I wanted a brighter steel than Leadbelcher. 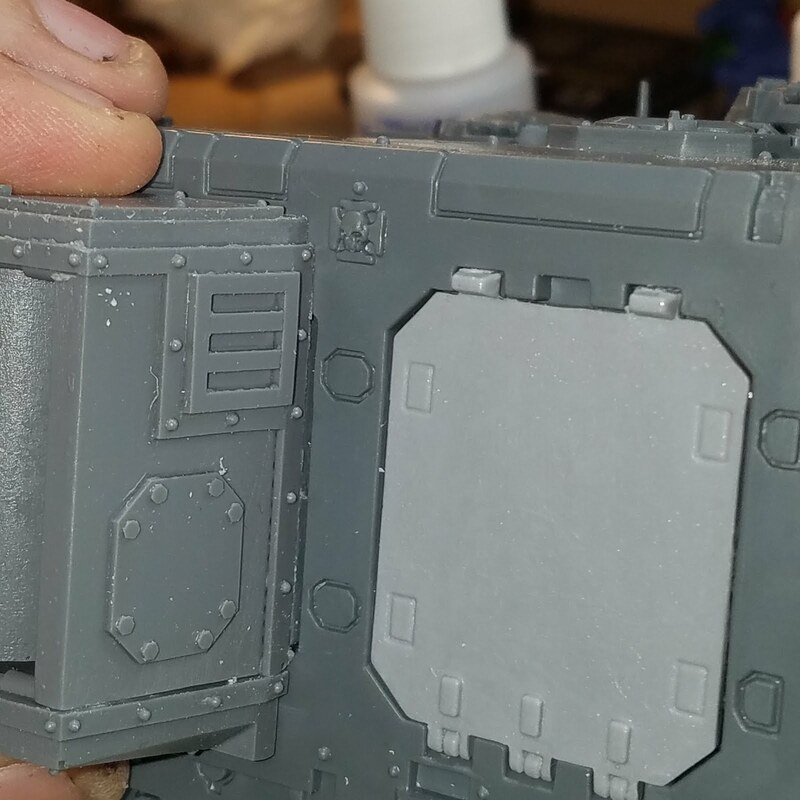 Once dry, I applied a GW Nuln Oil wash to the purple and silver areas. 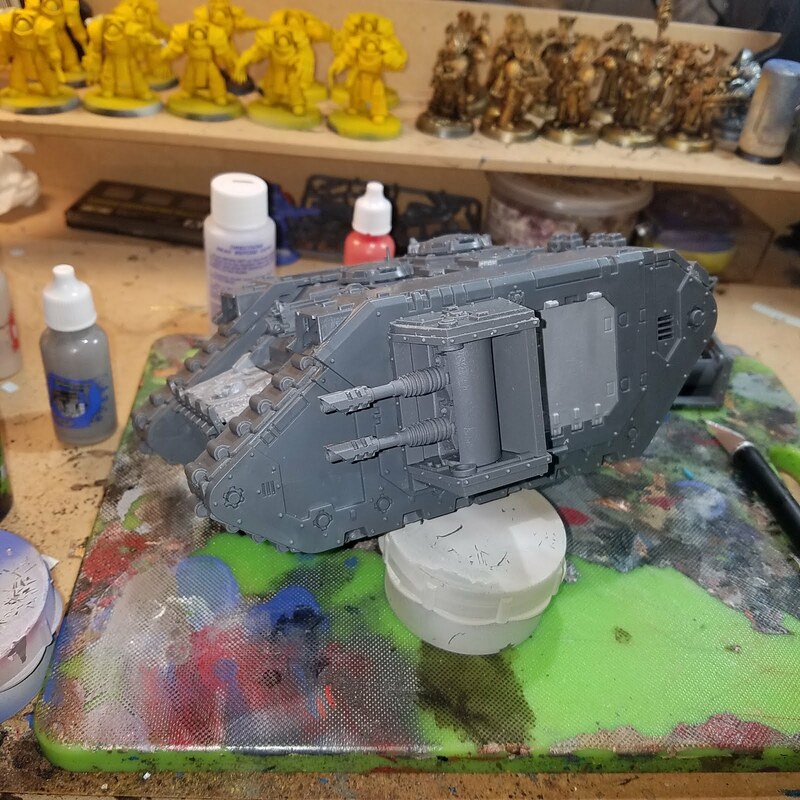 Step 4 - I went back to the gold trim, and applied an edge highlight with GW Auric Armor Gold, followed by a smaller edge highlight of GW Liberator Gold. 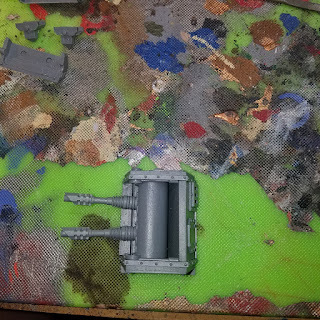 Step 5 - I re-blocked out the purple areas with GW Naggaroth Night, and then applied successive hightlight of 50/50 GW Naggaroth Night and Genestealer Purple. To the rear facing tabard, I applied both GW Naggaroth and the mix in successively lighter drybrushes. 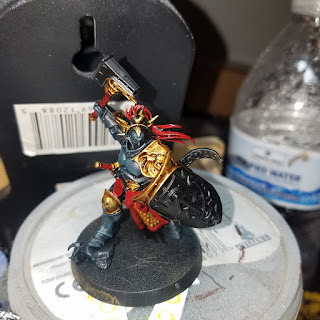 Step 7 - I then started blocking out the lightning bolts on the shield and shoulderpad with GW Mephiston Red. 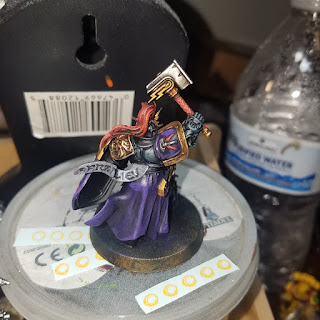 I painted the scrolls in GW Dawnstone. 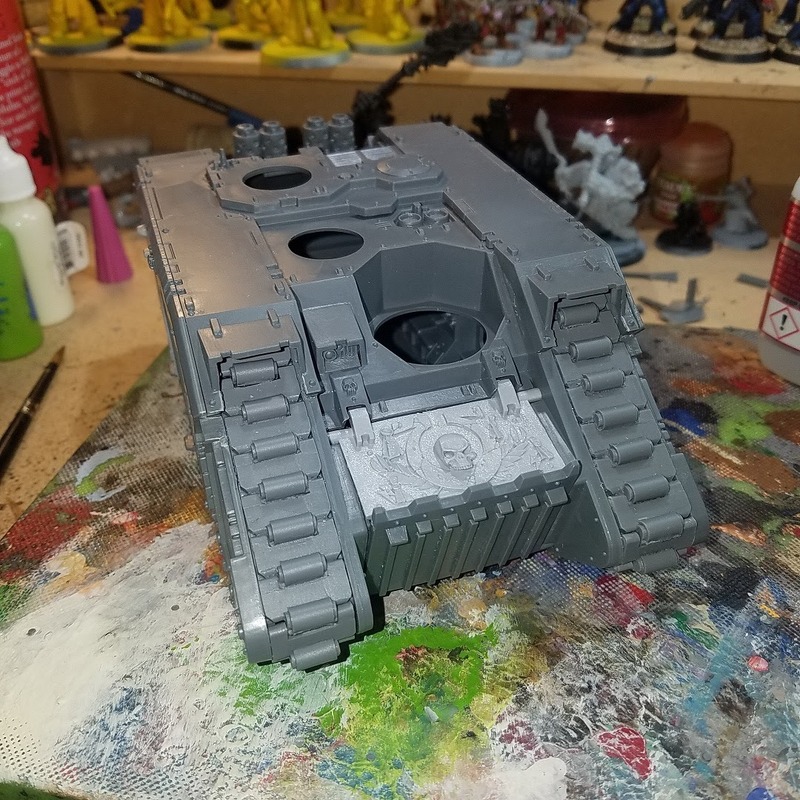 Once dry, I washed with Nuln Oil. 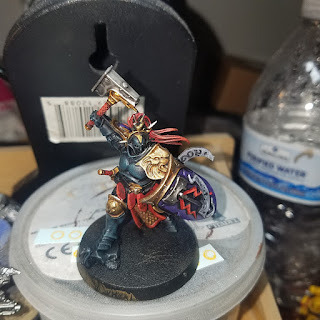 Step 8 - Finishing up - Once all washes were dry, I reblocked the lightening bolts with GW Mephiston, then applied successive highlights of GW Evil Suns Scarlet. I repeated the process with the hair and front tabard/ lappets. I reblocked the grey with GW Dawnstone, finishing with a highlight of VGC Stonewall Grey. 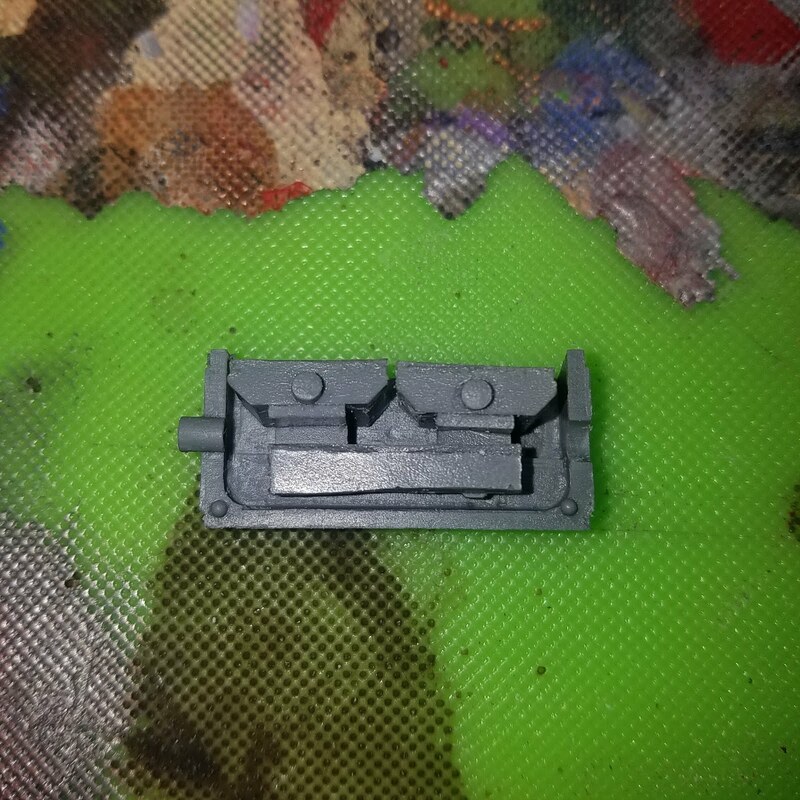 Finally I painted the eyes with GW Moot Green. Overall, fun to paint (I really like the color combos on this one) and pretty simple! Enjoy! First off, the new Ahriman model is amazing. Way more dynamic than the one that was put out in 2nd edition, and comes with an "optional" Disc of Tzeentch. If you are taking him in your army, you may not want to pay the points to put him on the disc, like me, but still wanted the option to put him on there and have him be secure if I do. 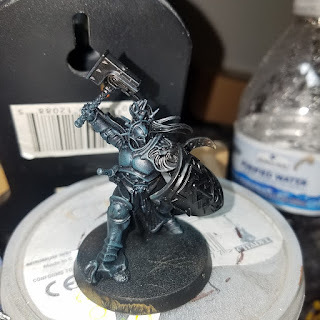 So, late last night, I decided to magnetize him, his disk, and a base for him. Since the rest of the Thousand Sons I am painting are going on the Sector Imperialis bases, I chose to base both Ahriman, and his disc, on spare 40mm bases I have. 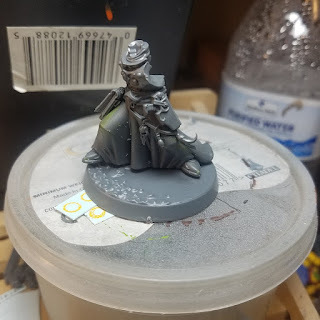 First thing I did was cut off the center peg hole on the base, and then scored the bottom of the base with my hobby knife. 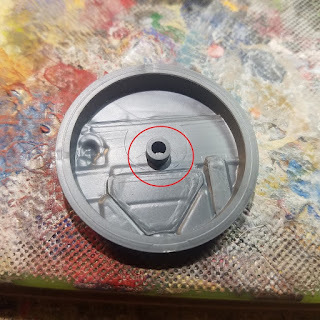 After selecting where I wanted Ahriman to go on the base, I glued a rare earth magnet to the bottom of the base, right on the scoring. 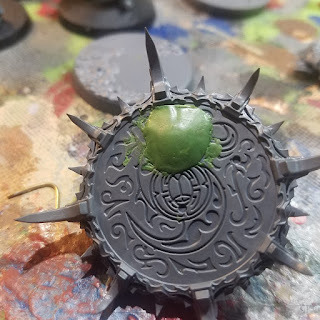 After the glue dried, I mixed up a ball of green stuff and squished it over the magnet, making sure to cover the scoring. The reason I did this is because, in the past, I have attached the magnet with just superglue, and it has come loose. 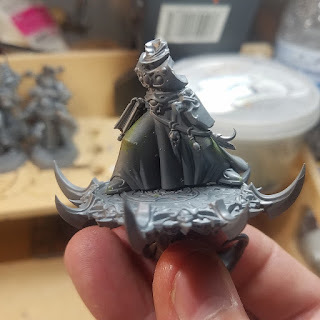 I took more green stuff and pushed it up into Ahriman's robes (he is hollow). While it was still tacky, I checked my second rare earth magnet twice, made sure I had the polarity right, and then pushed it into the greenstuff in his rob. 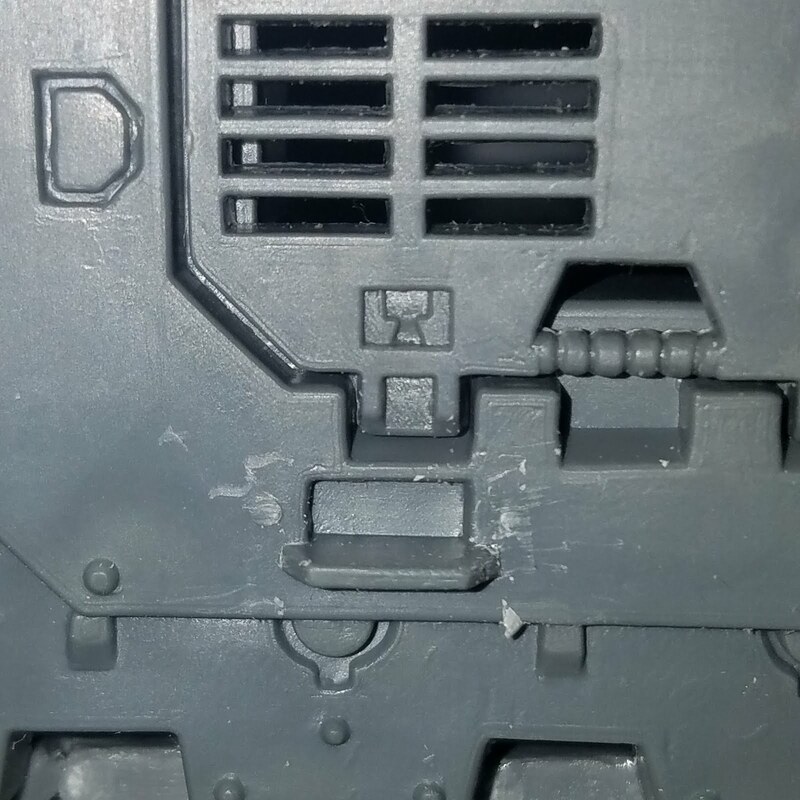 I recessed it a bit, just to make sure his feet were still able to touch the base. On the top of the disk, again, checking the polarity, I glued another magnet, and once the glue was dry, I squished more green stuff over the top of this. 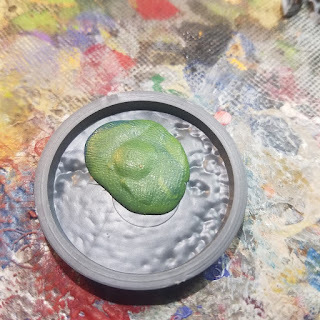 I got a small piece of plastic wrap and laid it over this blob of greenstuff, and then set Ahriman on top of this and pushed down. Getting the plastic wrap wet prevents it from sticking and pushing the model down mad sure he was standing on and not floating over, the disc. 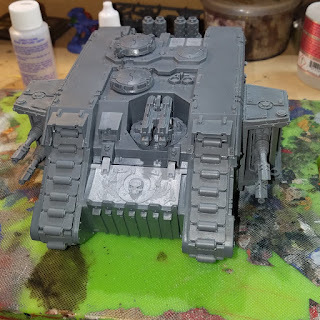 Some may ask why I didn't mount the magent underneath. Simple - no room. If I could have gotten one to fit down there I would have. So there we have it! 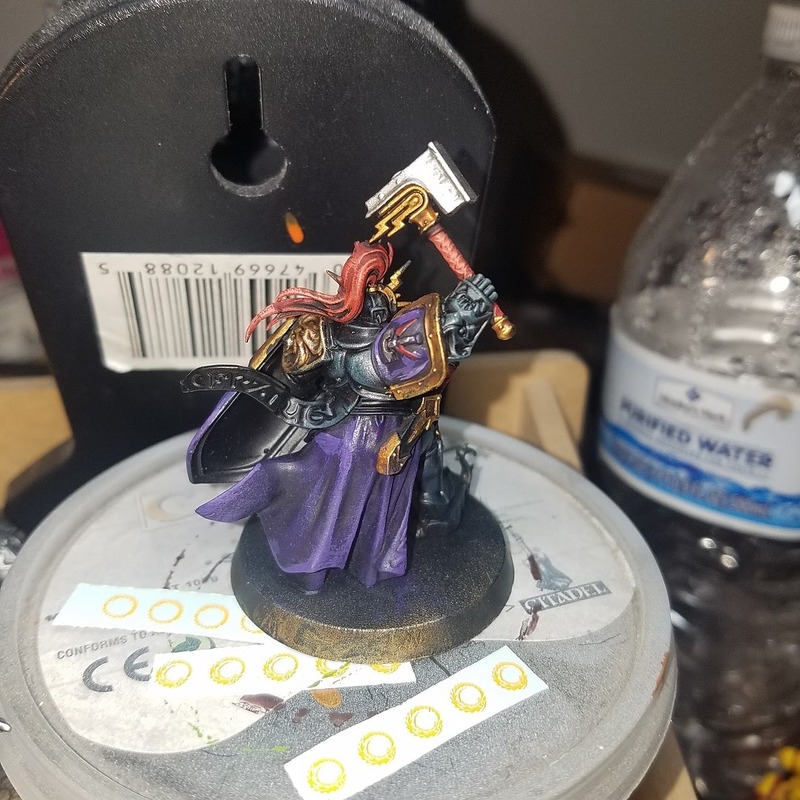 Ahriman, magnetized to a base and his disc. Now, I cannot sculpt at all, otherwise the green blob on the disc would be made to look really cool. However, since that is going to be covered by Ahriman when he is riding it, I will just paint around it!